End-user demand stepped up across all European countries in January thanks to higher power sector gas burn coupled with below-normal temperatures encouraging stronger res-com demand. 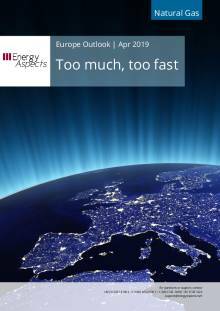 Greater y/y French and Belgian nuclear unavailability, weak hydro generation across some countries and higher coal-to-gas fuel switching increased power sector gas demand across Europe. LNG sendout remained strong y/y, with January port receipts up by 5 bcm y/y on a narrowing JKM-TTF spread that attracted additional spot cargoes into Europe. Pipeline imports from Russia surged by 1.8 bcm y/y on colder weather, while Norwegian and UKCS production was largely flat y/y. Stronger January demand has narrowed the region’s y/y storage overhang to a 4.4 bcm y/y surplus with inventories at 52 bcm. 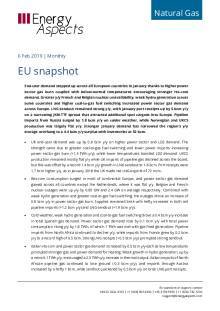 UK end-user demand was up by 0.6 bcm y/y on higher power sector and LDZ demand. The strength came due to greater coal-to-gas fuel switching and lower power imports increasing power sector gas burn (+1.3 TWh y/y), while lower temperatures boosted LDZ demand. UKCS production remained mostly flat y/y while UK imports of pipeline gas declined across the board, but this was offset by a record 1.4 bcm y/y growth in LNG sendout to 1.6 bcm. Port receipts were 1.7 bcm higher y/y, as in January 2018 the UK made net LNG exports of 72 mcm. 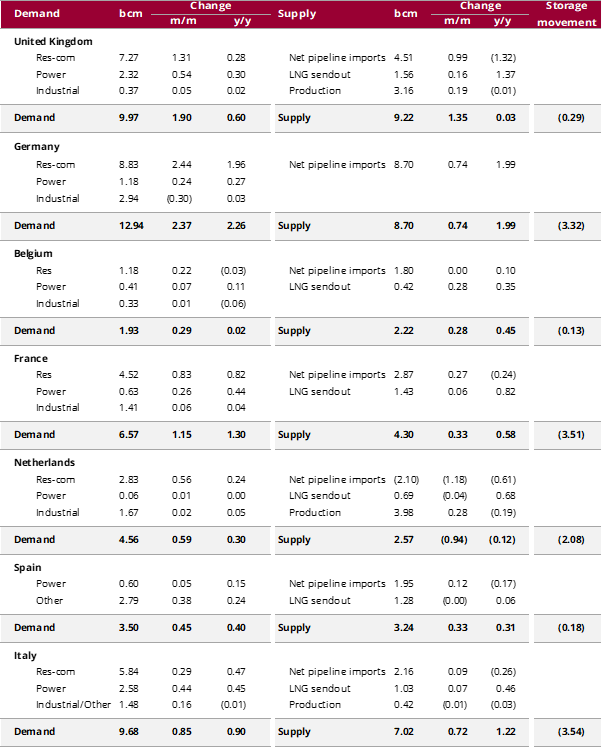 Res-com consumption surged in most of continental Europe, and power sector gas demand gained across all countries except the Netherlands, where it was flat y/y. Belgian and French nuclear outages were up y/y by 0.85 GW and 2.4 GW on average respectively. Combined with weak hydro generation and greater coal-to-gas fuel switching, the outages drove an increase of 0.8 bcm y/y in power sector gas burn. Supplies remained brisk with hefty increases in both net pipeline imports (+1.2 bcm y/y) and LNG sendout (+1.9 bcm y/y). Cold weather, weak hydro generation and coal-to-gas fuel switching drove a 0.4 bcm y/y increase in total Spanish gas demand. Power sector gas demand rose by 0.1 bcm y/y with total power consumption rising y/y by 1.8 TWh, of which 1 TWh was met with gas-fired generation. Pipeline imports from North Africa continued to decline y/y, while imports from France grew by 0.2 bcm y/y to a record high of 0.5 bcm. Strong LNG receipts (+0.5 bcm y/y) prompted strong sendout. Italian res-com and power sector gas demand increased by 0.5 bcm y/y each as low temperatures prompted stronger gas and power demand for heating. Weak growth in hydro generation, up by a mere 0.1 TWh y/y, encouraged a 2.5 TWh y/y increase in thermal output. Italian imports of North African pipeline gas continued to lose ground (-0.3 bcm y/y), and imports through Austria increased by a hefty 1 bcm, while sendout quickened by 0.5 bcm y/y on brisk LNG port receipts.